Home Apps Fun Quiz For Windows 8: This Or That..
Fun Quiz For Windows 8: This Or That.. This Or That.. is a free fun quiz game app for Windows 8 with a variety of funny questions that you would love to answer on your device. The quiz is one of those fun type quizzes where people ask your opinion about things. When you run the game on your device you will be presented with the main screen of the game where you will be shown questions that can be answered easily by simply clicking on one of the two options shown. This Or That.. is available for free from the Windows App Store. When you run the quiz, you will see the below screen. As you can see, right off the bat you will be presented with the questions with two options on your screen. 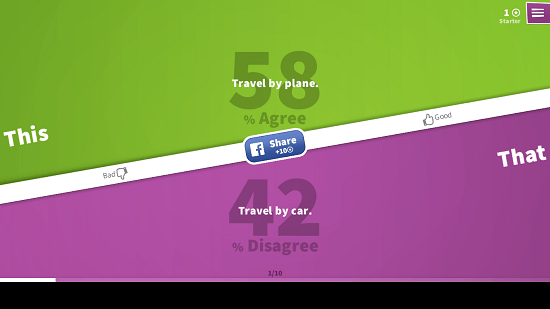 The above question asks you if you would rather like to Travel by plane or by Car. Now as I said before, the app is a fun quiz where no option is truly correct, and none is truly wrong either. It’s just a way to assess what people of different sorts think about stuff. So when you click on a particular option on your screen, you will be able to see what percentage of people believe in either of those choices, much like what is shown in the screenshot below. 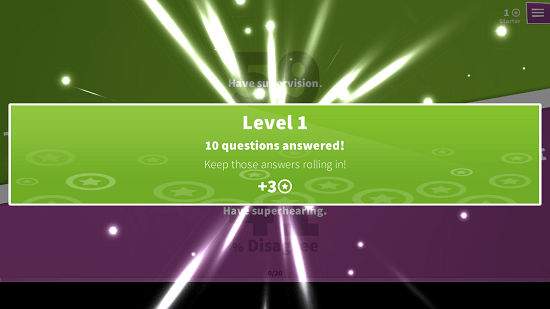 The quiz has various level, with each level having ten questions each. When you complete a level, you are shown the level completion screen which can be seen below. The above screen shows the level completion screen. Overall, this concludes the main features of This Or That for Windows 8 and 8.1 devices. 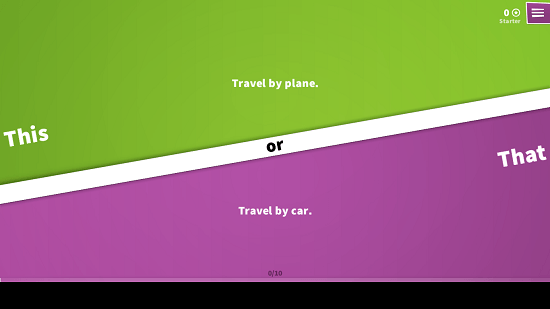 This Or That makes for a great quiz app which you can download and have on your device for free. You can grab it for free from the link below.